Re: Situation at Fomm ir-Rih. 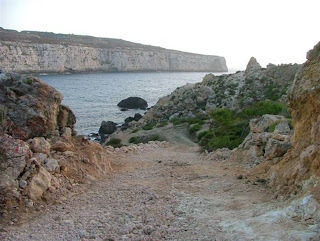 On behalf of the Ramblers Association of Malta I have to protest at the attitude MEPA is taking in respect of the situation at Fomm ir-Rih, now that the villa on top, Villa Delphino, is in the possession of new owner, Mr Joe Gasan. It is hard to believe that MEPA is unaware of the irreversible damage being done to this site that has Natura 2000 status. 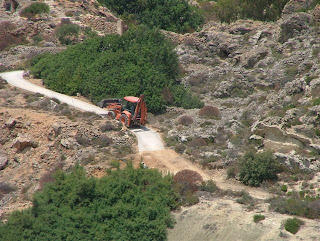 A Mepa Board Decision taken as far back as 1999 is being reversed and an Enforcement Order on fresh illegal development, instead of being ordered to be reversed as recently proposed by Minister Pullicino (his aerial photos scheme), is on the way to being sanctioned. The full story starts with the military road which up to some years back was public property and gave access to the beach and the foreshore. It was closed illegally when a simple barrier that stopped wheeled traffic but allowed foot travel to the beach, was replaced by a metal door that barred all but the former owners of the villa who installed the metal door and built the adjacent high wall. Public access and constitutional right of way to the foreshore was thus denied, and public property usurped. All was done without relevant permit. For some time now RAM has been promised by various Ministers that the situation will be remedied. To rub salt into the wound Mr Gasan has extended the military road in various directions in an area of exceptional beauty. Pristine natural habitats, scheduled under various denominations of conservation, seem to mean absolutely nothing to MEPA. The destruction becomes more serious when consideration is taken of the fact that these roads were not necessary and meant only to accommodate motorised sport and leisure of the owners of the villa (not necessarily the owners of the land and, certainly, not of the old road, beach and foreshore) in a highly sensitive and protected area. Rocks were broken and boulders removed to facilitate vehicle access to the shore, presumably for the owners to enjoy their water sport unhindered by common mortals. Enforcement Notice 00466/07 was recently issued to put a temporary stop to the rampage and misappropriation. In accordance with Minister Pullicino's new measures it should have been followed by aerial photos to check what was there before and then have the illegality removed before consideration is given to any relative application. However Mr Gasan through his architects Martin Xuereb & Associates now puts in an application to "Reinstate and marginally extend security fence, planting of indigenous trees / shrubs and reinstating rubble walls in vicinity of existing dwelling, repairing damaged internal roads and footpaths." This is an evident fabrication:even the MEPA mapserver can reveal the ante-mortem. Besides, there was only one road stopping mid-way and certainly no damaged internal roads to repair. Only foot paths led to the beach and to the fields. The "reinstating rubble walls in vicinity of existing dwelling" bit is also a 'clever' euphemism of scandalous proportions. Just consider that ten years ago the former owners also tried to enclose more land on the cliff edge through the construction of a wall without a permit. ECF01195/98 put a stop to this illegality. An appeal (826/98E) was lodged on the 9th November 1998 against the enforcement order but it was conclusively over-ruled by the decision of the Appeals Board on the 28th September 1999, confirming that the wall be removed within 16 days. Needless to say the enforcement order was never actioned and the wall allowed to stand. In the meantime more stone rubble was thrown behind the illegal wall for future use. Its time has now come. Enter Joe Gasan who unashamedly applies to sanction the wall: Application 05953/06 - "To sanction existing rubble wall (whole rubble) and extend same to enclose private property." It is a brazen wonder of wonders that the "DCC 46-01A/07, held on 24th April 2007, approved the application in view that the height of wall is acceptable and keeps away people from damaging the natural habitat and fauna." What an act of hypocritical environmental heroism! Everybody else, Maltese or foreign, is deprived from enjoying the views from a cliff top, disturbed by the former owners themselves with dumping of rubble, while the new owners selfishly enjoy them from the top in comfort. Everybody else is denied foot access to the beach and foreshore while the new owners are permitted to abusively get there on sporty jeeps driving amid virgin land of abundant flora and fauna, in a conservation area specially scheduled exactly against such insensitivity. And, please, spare us the pathetic pretext that the previous wall was refused for the reason that there was no permit and that the issue of maintenance was non existent. Walls over cliff edges are regulated by special conditions; need we remind MEPA of that? This is blatant contempt of the law and it is MEPA's duty to put paid to this abuse with immediate effect. Should the Authority not rise to the occasion the Ramblers Association will do everything legally possible to fight the injustice with the might of its numbers. Furthermore it intends to organise protests to reclaim the rights of civil society over the usurped areas. The illegal high wall (marked in red)subject to ECF 01195/98, was ordered to be brought down by the Board of Appeal in 1999. DCC 46-01A/07 has now reversed the decision and sanctioned the works. Rubble was illegally dumped behind the wall (marked in blue). Its time has now come to be used. Work being carried out without permit at Fomm ir-Rih. Note new road extension that is different in colour to old footpath, itself widened by vehicular use.